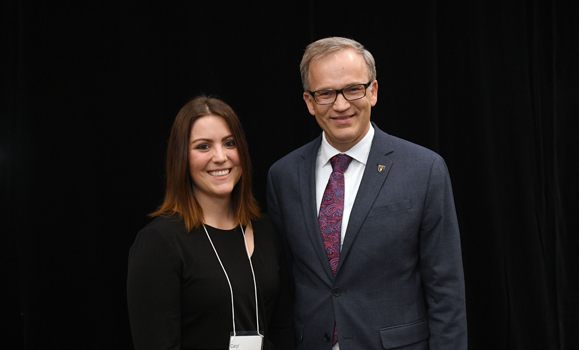 During an evening dedicated to celebrating philanthropy at Dalhousie, first-year student Carly Vande Weghe embodied the impact of giving through Dal to make a difference. While her intent was simply to share her own experience as an On Track Microbursary recipient with donors and friends at the annual Nova Scotia Donor Recognition Event, held on Tuesday, November 13, she eloquently conveyed the far-reaching effect and generosity of Dalhousie supporters. “I’ve come to Dal with big plans, I have my sets sight on law school,” said Carly, who is studying in the Faculty of Arts and Social Sciences. “I want to be an advocate for other people through law. Her speech drew a round of applause from the nearly 250 guests gathered in the John Lindsay Sr Design Commons on Sexton Campus. Carly’s story is just one example of how Dalhousie donors and friends empower students, strengthen research, and make a difference on a societal level. Carly with President Richard Florizone. “There’s something special about bringing together individuals, like you, who believe in the power of education,” said Dalhousie President Richard Florizone. 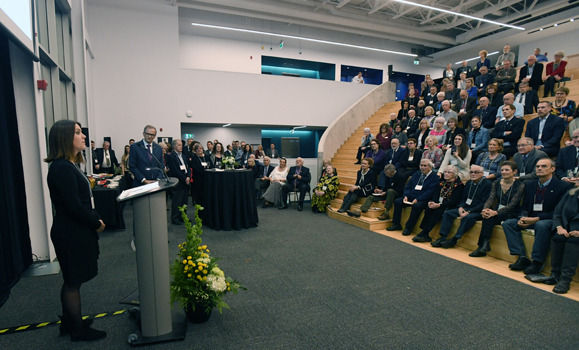 President Florizone remarked that it has been a tremendous year at Dalhousie, in part because of the university’s bicentennial anniversary, and because of the many accomplishments that have been achieved through collaboration and partnerships. And touching on the many successes of late – including the openings of the IDEA Project, Agricultural Campus Learning Commons, and the renewed Dentistry Clinic, as well as several generous gifts to the Performing Arts Campaign this fall. President Florizone highlighted that projects like these are collaborations that unite donors, government, industry, students and the university around shared opportunities to make a difference. “They are a testament to what is possible when like-minded individuals and organizations rally around a shared vision that benefits all,” he said. “None of these projects would have happened without the support of Dal donors. It is truly incredible what we accomplish working together. 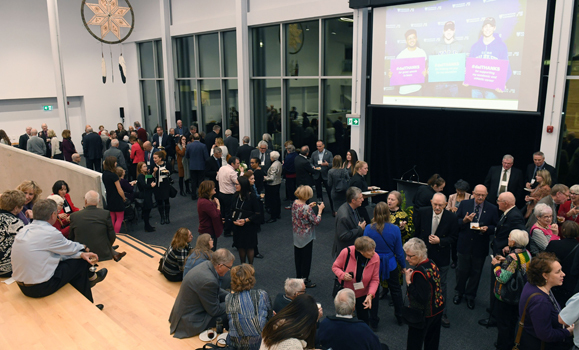 This year’s donor event also marked the second anniversary of the MacLennan Society, which recognizes Dal’s most loyal donors. Three hundred new individuals joined the MacLennan Society, many of whom moved from the bronze to silver level. There was also one individual, who wished to remain anonymous, that reached gold status for 50 consecutive years of giving. 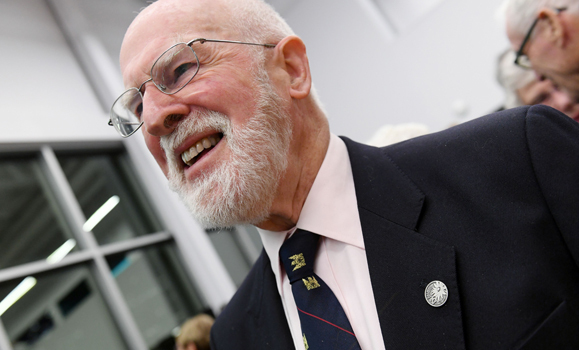 A donor proudly sports his MacLennan Society pin. A quick, impromptu game of trivia broke out as Dr. Florizone asked the crowd how many individuals they thought were inducted into the society in its inaugural year. With guesses that ranged from 70 to 6,000, a few surprised “wows” were audible when he revealed that 6,500 individuals were among the first cohort. And as the evening concluded, Dr. Florizone thanked those gathered in the room for their continued support during his five-and-a-half years as president and vice-chancellor. “I count myself as very fortunate to have had the opportunity to work with so many talented and committed supporters, and to see the progress that’s been achieved.